Archway Systems, LLC can provide NICET Stamps and reviews upon request. We can also provide P.E. Stamps for all fifty states for an additional fee. Below, our NICET certified personnel stands ready to assist your firm with any and all your needs. 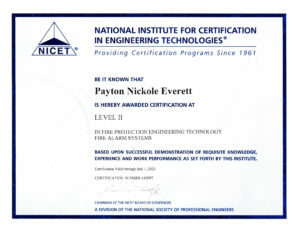 The Institute’s name “National Institute for Certification in Engineering Technologies”, initials/acronym “NICET”, logo, certification mark, and affiliation mark are registered with the U.S. Patent and Trademark Office as trademarks owned by the National Society of Professional Engineers. 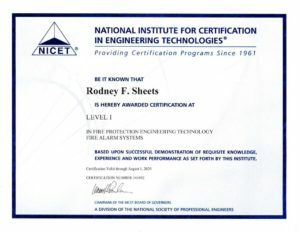 The Institute’s publications, marketing materials and examination materials, including but not limited to test specifications, test items, examination booklets, and psychometric data, are registered with the U.S. Patent and Trademark Office as copyrighted materials owned by the National Society of Professional Engineers. Unauthorized use of NSPE trademark or copyright protected material by any entity individual, company or group) other than NSPE or NICET is strictly prohibited under U.S. Federal Law, and will be subject to legal prosecution.